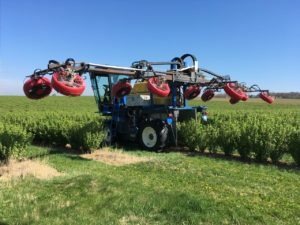 50 years of blackcurrant growing, development of mechanical harvesting systems, and associative engagement. 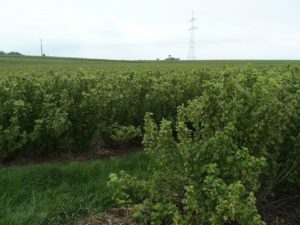 Blackcurrant growing in Germany without Rolf, Emmi and Michael Bullinger is unimaginable. 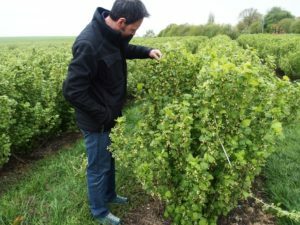 In April this year, I have paid a visit to one of the German blackcurrant growers, Michael Bullinger. All those who have attended our conferences have certainly already met him. 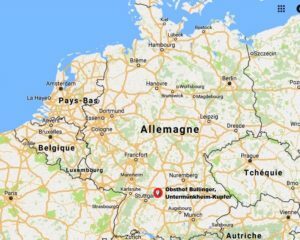 He is always present (although discreet), and he was also part of the organizing team of the German conference in Waldenburg in 2013. 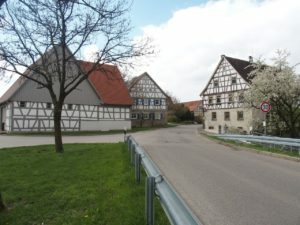 His farm, “Obsthof Bullinger”, is in Kupfer, not far from Waldenburg. 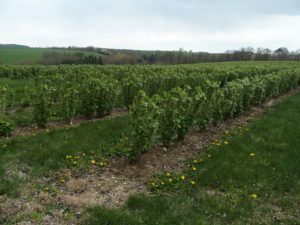 And it is a pure family business: no employees – only passion for blackcurrants. More than 10 years ago, Michael took over his parents’ farm. 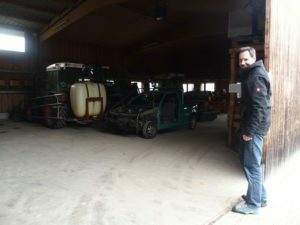 He has been trained as an industrial mechanic, but just like his father, he stayed with the family farm. Generation after generation, the Bullingers seem to have a passion for mechanics and love to fiddle about with machines. But their loyalty towards the farm is even stronger. 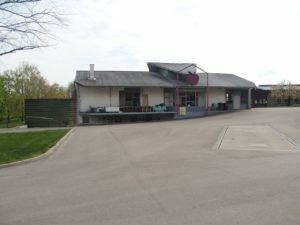 Michael’s father Rolf confesses that his own passion for mechanics was one of the reasons why he started to grow blackcurrants. “My parents wanted me to take over the farm. 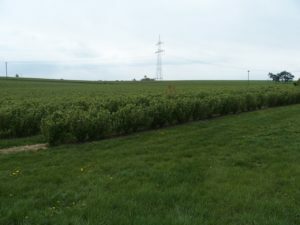 But I didn’t want to have cattle, so I chose to develop the fruits we already had: mainly apple or pear trees, but also some blackcurrants and strawberries.” In the late 1960ies and early 1970ies, the market was favorable for blackcurrants. 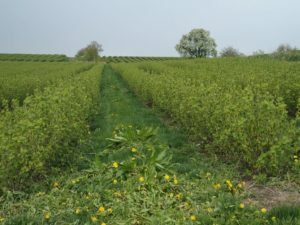 The growers got a very good price for their fruits – 5 Deutsche Mark per kilo (which would nowadays be worth more than 5 Euro). But they were handpicked! And whoever has already picked blackcurrants by hands can easily understand how fastidious it is – and the price was well justified. Rolf thought about specializing in blackcurrants, and needed to improve the harvest. 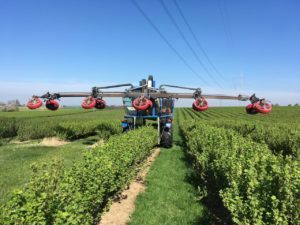 Therefore, he worked on a machine that could harvest the currants. 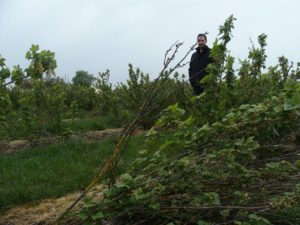 He built a harvester himself, with an existing chain saw that he adapted for rattling and removing the currants from the bushes. 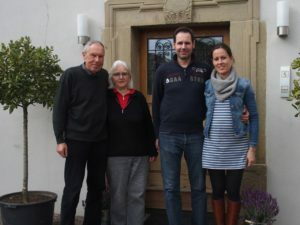 After his marriage with Emmi, they both specialized on blackcurrants only, and grew them on 75 hectares – which was almost half of the whole German blackcurrant grown surface. There had already been blackcurrant conferences on a European scale since the 1980ies. The German blackcurrant association is, by the way, closely linked to the Bullingers and would probably not exist without them. It was Rolf who created it in 1983. 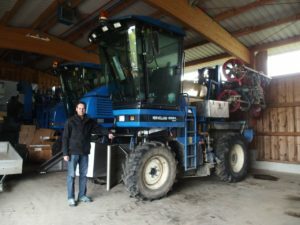 Nevertheless, when it comes to blackcurrant growing, technical skills are most welcome: Michael has worked on his New Holland harvester. By making some changes, he is able to deliver very clean blackcurrants: no twigs any more with the currants! 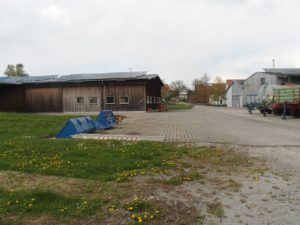 But not only the currants, also apples and pears will freeze – which are Michaels second income: his farm is a collecting point, where he is storing and fermenting the mashes for the production of industrial alcohol. “This has been done here for long years. But this year will be the last time. I want to stop this business and concentrate on my farming. Mashing my currants, which my buyers always fetch with their trucks, will be my focus. I don’t sell any blackcurrants for IQF.” Moreover, his parents are getting older. Without their help, Michael couldn’t face the work on his farm and for the collecting point. Michael drives me through his fields, and black or red currants are all around the hilly landscape. The soil is not perfect, as he confesses. 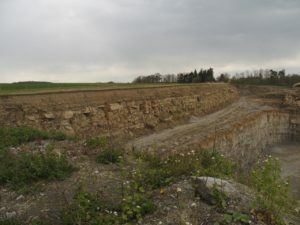 The layer of fertile land is not deep, and not all varieties grow well. He had a very bad experience in 2015 with Ben Hope, which completely dried out with the heat – whereas normally, it gives very good results. Michael chooses the varieties according to their sugar and acidity content. But of course, agronomic aspects take over. Variety Tiben doesn’t give a good yield, and Michael now decreases the 16 hectares he had already planted with them.